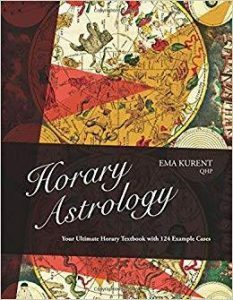 Horary Astrology: Your Ultimate Horary Textbook with 124 Example Cases, by Ema Kurent. CIP, 2019. 460pp. ISBN 9789619463703. When the book arrived, I was rather taken aback by the size of it: it is H-U-G-E! The author writes and explains in a clear and precise way. She explains techniques, rules, and regulations regarding the interpretation of horary astrology charts and reverts to a colloquial and easy-going style of narrative when questioning age-old interpretative methods adding her own findings which have been tried-and-tested during her 30 years of experience as a professional astrologer. With its many tables, including a super-handy guide for the affinity between signs and the planetary hour rulers, the book is an excellent reference tool for aspirant and practised astrologers alike and that’s where the “hugeness” of the book comes in handy: it’s the perfect size to keep on your work desk for perusal when needed. I really enjoyed the read, passing over some of the less familiar techniques more than once, and I think that the author has done a wonderful job. You can feel the dedication, time, and certainly the love of the craft that she has put into this book. I can’t wait to go through each one of the 124 (yes, 124!) practice charts that Ema has provided from her own archives, a very generous gift indeed! So, is the book slightly expensive? Yes, compared to others, but this book also offers much more information than most books on the same subject and here you have a complete horary book which could well stand in lieu of a much more expensive taught course in horary.